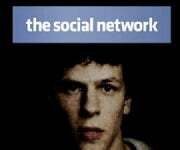 The theatrical trailer for The Social Network made its debut back in July. It does a great job of making the movie look promising (then again, so do most trailers). A dramatic, choral cover of Radiohead's "Creep" sets the mood while "screenshots" of the website cede to film footage with zippy dialogue from Jesse Eisenberg as Facebook founder Mark Zuckerberg. It's the making of a classic, or at least the foundation for a few good parodies. Since the trailer went live, the world has had its chance to poke fun at the movie and other social networks through tongue-in-cheek humor and -- in some cases -- darn impressive satire. The Facebook movie -- which is earning high praise, by the way -- tells an account of the founding of Facebook based on Ben Mezrich's book The Accidental Billionaires. The story is hardly unique when you consider many social networks start with a few friends and an idea. Twitter had Jack Dorsey, Evan Williams and Biz Stone; YouTube had Steve Chen, Chad Hurley and Jawed Karim -- and both have decent parody trailers. "If Hollywood can make an overly dramatic film about the early years of Facebook, why can't we make an overly dramatic movie about Twitter? Or at least the trailer to that movie!" The video is well composed (white balance, focus, etc.). It's almost believable as a trailer for an actual movie, instead of just a YouTube video. I particularly appreciated a point in the trailer when one character asks: "Twitter is restricted to only 140 words per post?" The main character responds, "Characters, 140 characters." In The Social Network's trailer someone asks Zuckerberg, "The site got 2,200 hits within two hours?" He replies: "Thousand. Twenty-two thousand." This one is more of the same. Decent video work, a little YouTube history, sneezing pandas, it's all there. Sure, Ebay isn't really a social network, but it was a pretty big deal when it first hit the scene in the mid 90's. Plus, we've all run into our share of beanie babies for sale or A++++++ sellers. This video swings a few punches at Apple's recently announced Ping feature for iTunes. There's not a lot too this video besides Steve Jobs at Apple Music Event. It does give a funny - somewhat exaggerated - look at Apple software update process.